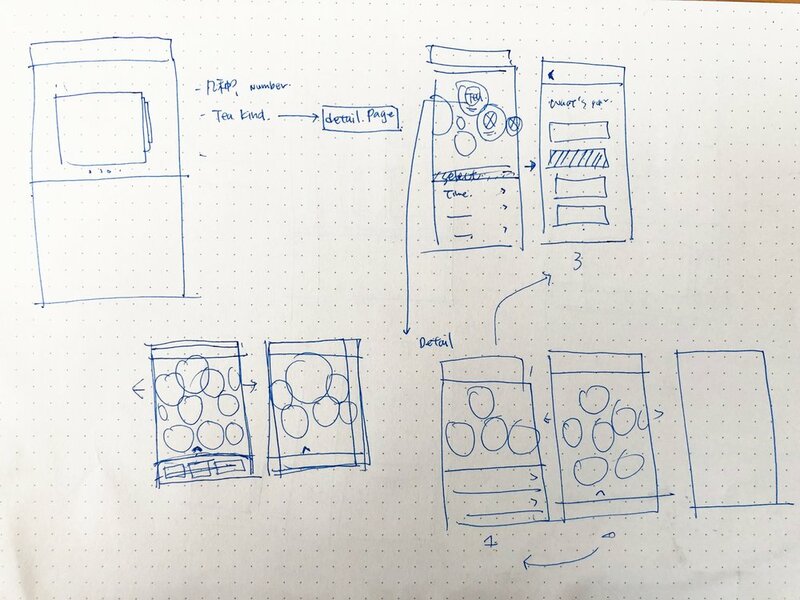 This is a 2 week UI Micro-Interaction Prototype testing project for A teaism Journey, a APP for tea novices to learn the way of tea. Throughout the years, I have been practicing the way of doing Chinese and Japanese tea. Before I started mu journey, I thought that making tea is pretty simple and easy - putting tea bag into a mug and pouring hot water. The fact is that teaism is actually a very delicate process that a lot of factors affect the outcome, from choosing the tea leaves to the infusion process, even the water temperature can affect the quality. That is, I created an APP that aims for tea novice to learn the way of tea. The factors that affect the tea and etc. Here are the user story and some asked questions, defining these requirements and needs before going further helps me keep track of my design decision and the final prototyping. To begin, I did the information architecture to ensure all the structures and behaviors would be consistent for users. As you can see from the graph below, the complete tutorial steps can briefly be divided into 4 section: onboarding, choosing tea, step by step tutorial, and the post-tutorial experience which provokes an emotional response upon completion of steps. This is a partial prototype of the process “Choosing Tea”. 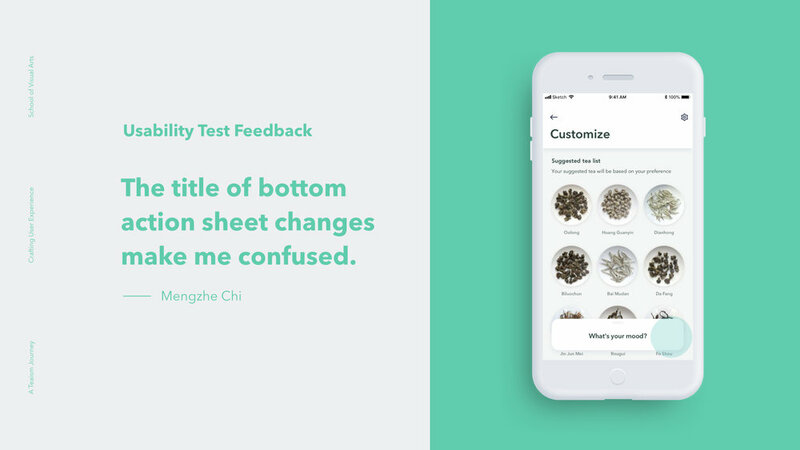 By using the action sheet below, users can choose the tea based on their mental and physical conditions and the occasion when they are making tea. Users can customize their preference by the bottom action sheet below, the recommended tea list will change according to their selection. Before the users confirm the tea they want to make, they can browse the detail page for each tea kind which provide the water temperature, time, measurement, tea origins, tools, and how-to information. After the design of version 1, I did a rapid test for the prototype. 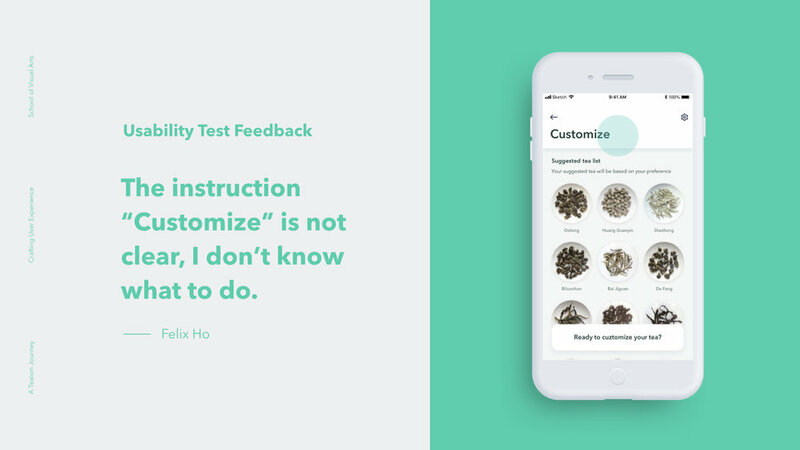 The tool used was Principle, so I provided my interviewees with a mobile device and observed how they operated and played with the prototype.